Discussion in 'Team KIII' started by CherryBlossom48, Mar 19, 2014. Last week was a big win for jkt48 world. 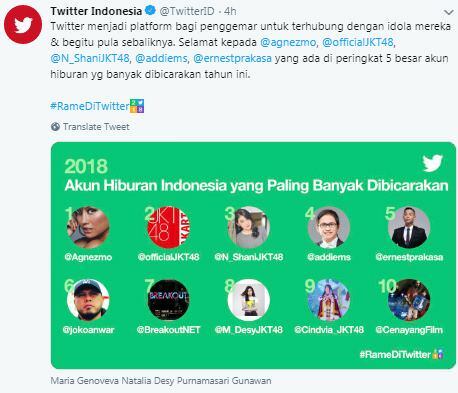 The official and members twitter accounts [Shani, Desy & Yupi] are among who regarded by Twitter Indonesia as “the most talked accounts”. The no. 1 is the famous singer Agnes Monica, there're also stand-up comedian, senior musician, movie director, tv music program and film reviewer. Desy is in no. 8, her lucky number. As for Desy I like her regular tweet status asking fans with the simple “ Lagi apa?" (means "what 're u doing?). I find it friendly as well as cute. The fans then would happily replying with their activities at the moment: eating, at the office, working, on the road etc. Twitter [and IG] have been strongly support the existence of jkt48. It's been really fun for fans and it's still. Also thanks to Indonesian people tend to bring things to anything humor when interacting including in social medias. Once I checked western celebs accounts the viewers comments or reactions are usually predictable lip services. So there's benefit of most Indonesians lack of westernized education their expression and energy are more sincere and less analytical. When we feel like salty then go to twitter checking their timelines our mood may be healed with the funny status or refreshing cute photos. 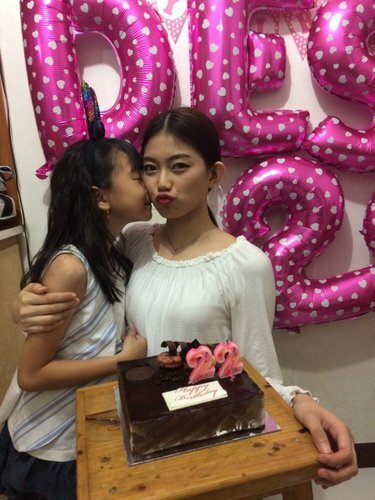 Desy with little sister Cien Cien at her birthday celebration Tuesday ago. She might stood on a chair here to kiss big sis but seems looking taller than the last year. From Ig Desy captioned this pic with yuuhiwomiteiruka-ish "D'you like sunset?" For folks in the fasting month Ramadhan, sunset /dusk is the most expecting moment to break the fasting and end the starving. For those who live in villages, each sunset there are pigeons hovering the orange sky. The whistles at their necks produce strange howling sound. Perfect scene to close the curtain of a daylight then comes creeping the dark of night. So Desy currently got a regular job on tv cohosting Takeshi’s Castle Indonesia. If I can remember the original show, my mind’s recalling the general Hayato Tani with his Japanese aristocratic “Yamato” look. Also the cute catchy face reporter Shingo Yanagisawa [who recently played in Ultraman Orb]. As now Yanagisawa is older I think he’s very eligible to play as Akiro [used to play by Mako Iwamatsu] if there’s a remake of Arnold Schwarzenegger’s Conan The Barbarian/Destroyer or tv series.